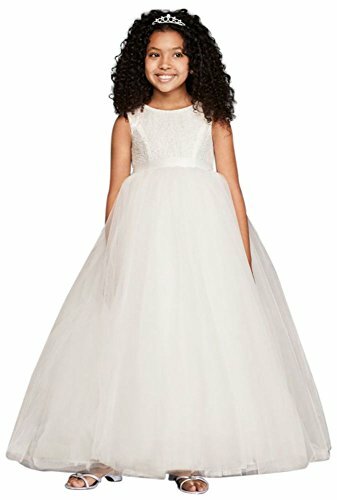 Flower girls will feel like they re living in a real-life fairy tale in this ball gown with a full tulle skirt and lovely lace bodice. The sweetest part: a heart cutout and bow in the back. Polyester Button closure; fully lined Dry clean Imported Includes sash in same color as dress White and soft white dresses shown with STNRN sash in quartz ; whisper pink dress shown with STNRN sash in Ballet, sold separately Perfect for First Communion!